This category contains 9 products and 2 subcategories. 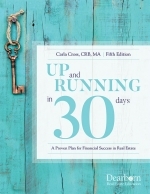 The processes and systems you need to take your career to a real business: The Business Planning System for the Real Estate Professional, Your Professional Portfolio, Your Client-Based Marketing System for Sellers, The Complete Buyer's Agent Toolkit, and Objection Busters for Buyers and Sellers. Managers: Use these programs to train your agents for much more productivity--and increase your profits!